384% Trending now. Get kitted out in style and make savings when you buy with these adidas cashback deals! Sign up for free and just shop with adidas Shop as normal. Our average member earns over £300 cashback a year. adidas Shop cashback can be earned simply by clicking through to the merchant and shopping as normal. adidas Shop Cashback is available through TopCashback on genuine, tracked transactions completed immediately and wholly online. The return policy for adidas Shop is now 30 days and 14 days for hyped articles. Go online shopping for sportswear and casual clothing for men, women and children from one of the world's leading brands and get a little back with our Adidas discount codes and cashback deals. When it comes to footwear, you will discover Adidas shoes for golf, football, skateboarding and many other sports, plus Stan Smith Primeknit, Pure Boost, Ultra Boost and Swift running shoes, while their extensive clothing range includes everything from T-shirts, track tops and base layers to dresses and trousers. You will find plenty for the kids too, including baby clothes, while football fans can purchase Manchester United, Chelsea and Bayern Munich replica jerseys. Search for sports essentials by categories like rugby, cycling and hockey, browse new arrivals and the week's top sellers, or visit the outlet section for Adidas discounts of up to 50% on apparel and accessories like watches and gloves. Customise your own trainers with mi adidas, while they offer free standard delivery on all orders over £50 and a free Click & Collect service. Whether you are looking for bags, hoodies, jackets, shirts or sweatshirts, you will find a selection of brands on the official Adidas website offering all you could need. Go shopping for Adidas neo trainers and hi tops, while the Adidas Originals collection features Gazelle men's shoes, tracksuits, swimwear, socks and more. If you are into your running or training, Adidas Athletics offers performance shorts, pants and hats for outdoor or indoor exercise. Women will love the Stella McCartney collection, which includes the Stellasport range. It will allow you to participate in sports without compromising on style as it features light, bright and innovative materials - ideal for everything from playing tennis to hitting the gym. Finally, the Porsche Design Sport selection provides comfort, functionality and style, and offers tech jackets, backpacks, polo shirts and more. If you want to shop Iconic trainers and clothing direct with the brand while still saving money, be sure to grab an Adidas discount by choosing one of our cashback offers above. Those in search of the best money off deals on the Adidas site can check out their outlet section, where you can discover a whole range of styles at an up to 50% reduction. The outlet area is also where Adidas host their sale event, which is also when you’ll find a load of new lines added. To hear about the launch of a sale first it’s best to subscribe to their email newsletter, plus you’ll get notified about new line drops, get info on special promotions, and even get a discount code for signing up. A final thing not to forget is that Adidas offer free delivery when you spend over £50, and with thirty days free returns, you’ve got plenty of time test any purchases. The Adidas brand has certainly come a long way since Adi Dassler started it in the wash kitchen of his mother's house in a small town in the Bavaria region of Germany. He registered the 'Gebrüder Dassler Schuhfabrik' in 1924 and embarked on his mission to provide athletes with the best possible equipment. The first Olympic gold medal for one of the company's athletes was won at the Amsterdam Games of 1928, and this was backed up by the great Jesse Owens in 1936. These were the company's first rewards and milestones. In 1949, Dassler started over again, registering the 'Adi Dassler adidas Sportschuhfabrik' and began work with 47 employees. The same day saw him register a shoe which included the now iconic Adidas three stripes. The brand became a household name in 1954 when Germany defeated Hungary in the World Cup final wearing lightweight Adidas football boots which featured screw-in studs. The company branched out into clothing in 1967, when the Franz Beckenbauer tracksuit model made its debut, while they conquered another branch of the sporting goods industry in 1970 with the TELSTAR - the official ball for the World Cup finals. They introduced their new Trefoil logo in time for the 1972 Munich Olympics. When Adi Dassler died in 1978, his son, Horst, with support from his mother, took over and continued to master his father's invention until 1987, when he died suddenly, two years after his mother had passed away. From humble beginnings, Adidas has become a truly global sports brand. As each of us has our own style, mi adidas customisation allows you to choose your favourite model, colours and material to design Adidas trainers which will be the envy of your friends. Either view all styles, or narrow your choice down to originals, basketball, baseball or running shoes, and start personalising them by selecting the size, as well as the colour of the base, eyestay, tongue and tongue logo. You can also select what colour to have the iconic three stripes, the lining and the laces, as well as the heel and heel logo, the midsole and outsole. Finally, to make them truly unique, you can have your name on the sole. Get creative and make their men's shoes or women's shoes your personal fashion statement. Adidas provide various apps which will aid your shopping and fitness experiences. Their CONFIRMED app will give you exclusive access to the latest trainers as soon as they become available. Find out which exclusives are available in your location, while to be eligible, you will need to subscribe with your Adidas account and provide your shoe size. You will need to be fast to make sure you do not miss out, while when you show your CONFIRMED reservation at your chosen store, you will be able to complete your purchase. Use the GLITCH app, meanwhile, and you will be able to get your hands on the world's first fully interchangeable football boot. The boot is only available via the app, so download it, get your invitation code and order your starter pack. If you are looking to join a supportive community to help you set and achieve your fitness goals, the RUNTASTIC app is for you. Whether it is for running, strength training, weight loss or nutrition, it can guide you and keep you motivated. Find new workouts, tips and motivation, and let it help you achieve the results you want. 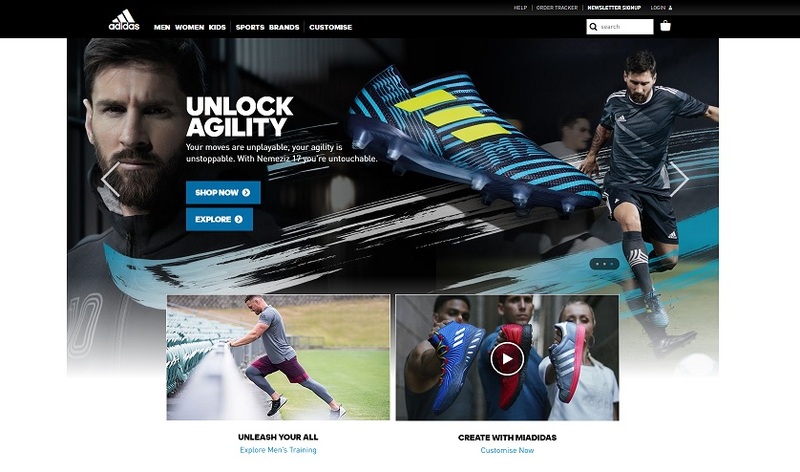 Click on the Adidas offers and promotions page and you will discover their current special deals. Sign up with your email address and not only will you get a special offer, but you will gain access to special savings deals. You will be able to save yourself up to 50% by shopping in the Adidas Outlet, where you will find the best men's and women's products for less. You can also help others make the right choice - and Adidas improve their products - by writing a review of your purchase. As a reward for doing so, you will be able to save 15% on your next order with every review you write. All you need to do is upload your review and wait for the confirmation email, which will contain your voucher code. Use this and it will give you 15% off when you enter it at the online Adidas store checkout. Adidas offer free shipping via standard delivery on all orders over £50, as well as a free Click & Collect service, while mi adidas delivery will also not cost anything. Delivery times vary depending on the type of product and delivery method. When it comes to standard items which are not being personalised or customised, you can have them delivered to your home or to a Collect+ store in 3-4 business days, while you will be able to collect it from an Adidas store within 2-5 business days. For personalised items, you should add an extra 1-2 days, while delivery of mi adidas products takes 4-6 weeks. With mixed orders containing a mi adidas products and a standard item, they will send the standard product first to avoid you having to wait until the mi adidas product is ready. When you place an order at the checkout, you will receive a shipment confirmation email, which will contain a link which will enable you to track your parcel, while you can also visit the 'Order Tracker' page and enter your order number and email address. Get kitted out in style and make savings when you buy with these adidas cashback and discount code deals. adidas.co.uk offers the latest and greatest gear adidas has to offer at any particular moment. Shop for shoes, clothing and collections like adidas Originals, which reflects the timeless adidas heritage, and get a discount with our offers. Whatever your sport, whether it be football, running, basketball, training, golf or tennis, their innovations strive to support athletes aiming to achieve even better levels of performance. Shop the new adidas Stellasport collection now! The adidas StellaSport collection is aimed at action girls and combines both sport and style. The range includes vibrant apparel, footwear and accessories that can be worn from the gym to the city streets yet introducing sports performance technologies. The collection includes everything from kit bag essentials to standout statement silhouettes.